Photographs published by a Washington, D.C., think-tank and provided to Congress show Iran using its flagship commercial carrier, Iran Air, to ferry militants to Syria, where they have joined the fight against U.S. forces in the region. The new photographic evidence has roiled congressional leaders, who accuse Iran of violating the nuclear deal, which prohibits it from using commercial air carriers for military purposes. These lawmakers are demanding the Trump administration investigate the matter and consider imposing new sanctions on Iran. The release of these photographs allegedly showing Iran Air's illegal activity comes as top U.S. air carrier manufacturer Boeing moves forward with a multi-billion dollar deal to sell Iran Air a new modern fleet. Many in Congress have opposed the deal due to Iran's longstanding use of commercial aircraft for military purposes, such as transporting weapons and troops to regional hotspots such as Syria and elsewhere. It remains unclear the extent to which the former Obama administration was aware of this activity, which came in part while it was promoting Western airline sales to Tehran. Iran Air's central role in the illicit transportation of militant forces to Syria could complicate Boeing's efforts to move forward with the sale, which still requires approval from the Trump administration's Treasury Department. Congressional leaders are now calling for a suspension of all licenses permitting these sales in light of the new evidence, according to a letter obtained by the Free Beacon. "Iran's use of commercial aircraft for military purposes violates international agreements as well as Iranian commitments under the JCPOA," or Joint Comprehensive Plan of Action, according to the delegation of lawmakers pushing for an investigation. "We believe these photos mandate a thorough investigation of these practices and a comprehensive review of Iran's illicit use of commercial aircraft." "During this investigation, the United States should suspend current and future licenses for aircraft sales to Iran," the letter goes on to say. Those calling for an investigation include Reps. Peter Roskam (R., Ill.), Lee Zeldin (R., N.Y.), Andy Barr (R., Ken. ), and David Reichert (R., Wash.). "Iran Air has engaged in Iran's illicit transport of military goods and personnel to Syria since implementation of the" nuclear deal, the lawmakers write. The Treasury Department has vowed in the past to consider and investigate any new evidence revealing Iran's illicit use of commercial aircraft. The lawmakers are urging the Trump administration to make good on this promise. "In light of these assurances to both investigate evidence of Iranian wrongdoing and to re-designate Iranian airlines engaging in sanctionable activity, we strongly urge you to investigate the enclosed photos," the lawmakers write. "If as a result of your investigation, you find Iran Air guilty of conducting military transports with commercial aircraft, it should be re-designated." The new photographs, reportedly taken in 2016 and 2017, show Iranian fighters aboard Iran Air planes on their way to Syria to pick up arms in support of embattled President Bashar al-Assad. The militants are believed to be affiliated with the Fatemiyoun Brigade, an Afghan Shiite militia, according to the Foundation for Defense of Democracies, which first disclosed the photographs to Congress. 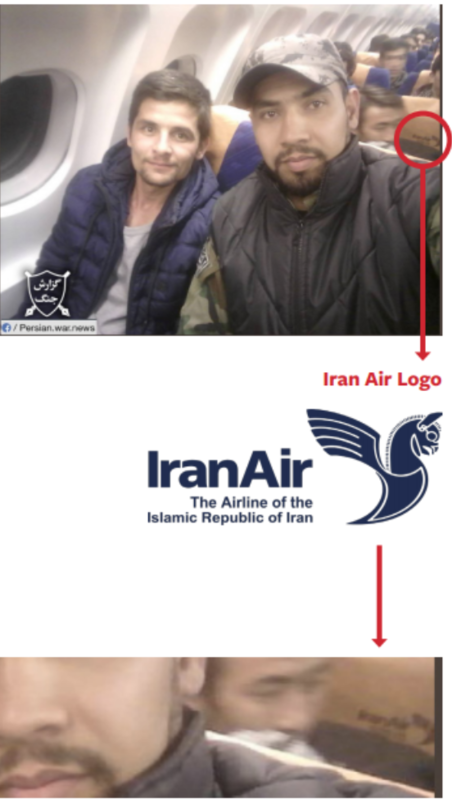 "These photos seem to display militiamen sitting on seats clearly labeled with the Iran Air logo," the lawmakers inform the Treasury Department. "These individuals are not Afghani civilians; they are believed to be members of an Iranian-backed militia, trained and funded by Iran's Islamic Revolutionary Guard Corps (IRGC), actively fighting for the Assad regime in the Syria." Iran Air is guilty of "facilitating the ongoing atrocities committed against the Syrian people by the Assad regime and its allies," the lawmakers write. The issue has become all the more pressing in light of recent attacks by Iranian-backed militias on U.S. forces operating in Syria. "We strongly urge you to swiftly investigate and conduct a comprehensive review of Iran Air's role in supporting Iran and the Assad regime militarily, and hold accountable those found guilty of such activity," the lawmakers write.